There can be no doubt that pizza ovens make great food. Not only that but they can be a fun experience, especially when you have guests around. But, pizza ovens don’t just have to be an outdoor experience. Instead, there are plenty of indoor options for pizza ovens as well, regardless of your budget or space limitations. The most extreme example would be to build an actual wood fire pizza oven into your own kitchen. The idea isn’t as unusual as you might think and can appeal to people who are already planning to remodel the area. But, let’s be realistic. Most of us probably don’t want to invest that much time and effort into a pizza oven, regardless of how much we love our pizza. This is why countertop pizza ovens are such a great deal. For one thing, they simply take up so much less space. Plus, this type of pizza oven is typically portable, so you could store it away when you’re not in the pizza-making mood. In this post, we’re taking a look at some of the different countertop pizza ovens for inside your home that you have to choose from. Some are fairly similar to one another but there are also some more unusual items on the list that may be particularly interesting. Gas is a popular choice for pizza ovens, especially as it is much easier to have a portable gas oven than a portable wood fire one. In fact, there are many different gas countertop pizza ovens available – although most are designed for outdoor use rather than indoors. In practice, you can use many gas countertop models indoors, as long as you are careful. Make sure to run the fan on over your oven or open a window for to get rid of any fumes. But gas stoves do fine inside the home, so I don't see an issue with using a propane BBQ indoors either. Some of these would also be a great choice on the balcony of an apartment. After all, you typically won’t have space for a full size grill on a balcony and many apartments won’t let you burn wood or charcoal anyway. Likewise, you could easily use these pizza ovens in the garage or a shed – the key is simply good ventilation. The Pizzacraft Pronto makes a great example of a gas pizza oven. The product is one of two options from the Pizzacraft range and is popular for its overall design and efficiency. Like most gas pizza ovens, it can be powered by a regular gas tank or a portable 1 lb option. 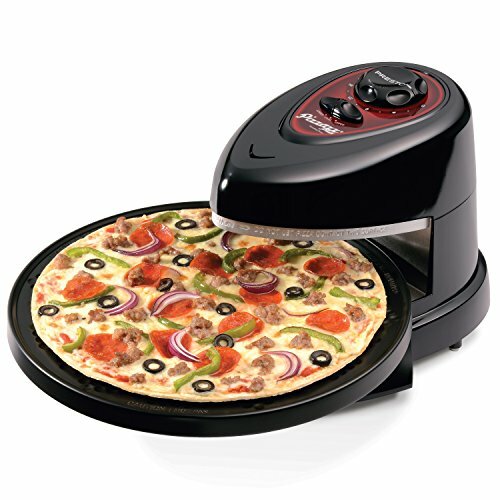 The device works well for pizzas and is able to cook them in roughly five minutes, depending on dough thickness and the toppings that you have in place. The pizza oven is also extremely portable. So, it’s common to see people use it for tailgating or even when out camping. This is an unusual choice for a countertop pizza oven and one that I sometimes ignore. However, it can be a good product in some situations, particularly for indoors. The item here is actually just promoted as a gas oven, rather than a pizza oven itself. It is also considerably larger than most countertop pizza ovens and you wouldn’t want to be moving it regularly. All of those areas sound like limitations but that’s not really the case. Instead, this product functions as a larger pizza oven, giving you the chance to cook multiple pizzas (or other foods) at the same time. Another unusual aspect is that this is actually designed for indoor and outdoor use. For that matter, it can even be converted to run off natural gas, which is extremely unusual for a gas pizza oven. As a result, it could easily become a permanent feature of your kitchen if you wanted or it could be an outdoor pizza oven running off propane. This selection doesn’t cover all of the gas countertop options, just two of them– but you can find a larger list elsewhere, if you’re interested. However, most of the products out there are fairly similar to the Pizzacraft Pronto and the main differences are often just brand and physical style. But, as mentioned before, those products aren’t really designed for indoor use – and you’d have to take care when using them as such. Nevertheless, the style does offer some advantages, especially as the pizza oven could be used outdoors in good weather and indoors (or on a balcony) when the weather is more disagreeable. The other common option for indoor pizza ovens is electric. Unlike a gas pizza oven, these are typically designed for indoor use only. This tends to make them more practical in many situations, especially if you’re not planning to cook in your backyard. Additionally, there are various styles, some of which are better pizza ovens than others. As a general rule, an electric pizza oven won’t get as hot as a gas or a wood fire one, which compromises some of the quality of your pizza. But, they do have advantages in other areas, especially as electric pizza ovens do tend to be more convenient. Most of them will also cook other types of food extremely well. That outcome is great if you have a small kitchen or simply don’t want too many appliances. 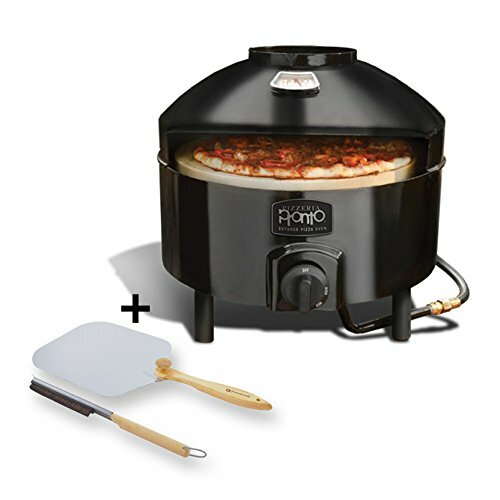 The Presto Pizzazz is a very inexpensive option for a pizza oven and a slightly odd one as well. Basically, you’ve got a head that hovers over a spinning plate, heating it up. To be honest, the device doesn’t look like it would do much of anything but that’s not the case. Instead, reviews for this device are overwhelmingly positive – regardless of whether you use it for pizzas or other food. For that matter, some people swear that it can replace an oven or a microwave in many situations, especially as it is much more practical and convenient. Likewise, the product works well for many different types of food, making it an extremely versatile tool. For these reasons, this ‘pizza oven’ may be worth considering. It is a very practical choice, especially for people who don’t have much kitchen space. It would also be great for anybody who just wants something simple indoors, as they have an outdoor approach as well. Still, be aware that this isn’t ever going to get as hot as an actual pizza oven. This is a given for any electric option but some products do manage better than others. Plus, with how inexpensive the product is, it would be easy enough to simply give it a go for yourself. 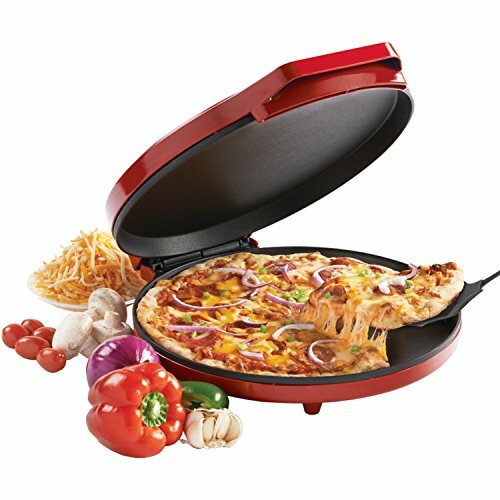 This product is marketed as a pizza maker, rather than a pizza oven, which should give you some idea of what to expect. The design here relies on closing the lid to trap in heat and also works well for many other types of food. Now, the style is never going to be amazing for pizza. It only goes up to 400°F, so the outcome won’t be as crispy as other options. Plus, you can’t adjust the temperature, resulting in very little control overall. But, as with the Presto Pizzazz, this is an inexpensive option and may be valuable if you want a multi-functional device. There are also other similar products out there that work in the same way and come from a different brand. So, you can pick and choose somewhat based on what company and style you like. But, this one is a good choice to begin with, simply because it tends to get great reviews. In many ways, this pizza oven is similar to the option from Better Crocker. But, the company does have a strong emphasis on pizzas specifically, which is an advantage. In this case, the oven actually includes a ceramic pizza stone, along with a two-piece pizza peel. There are also temperature settings, so you have more control over how your pizza turns out. 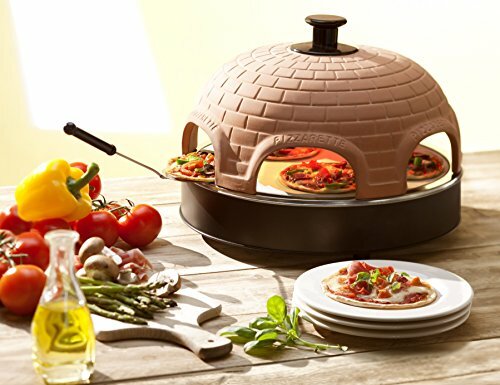 A different style altogether is this pizza oven from Wisco. The key difference is that the product looks and feels more commercial, although it could still be used in a regular kitchen. While the style may not be visually appealing, it is small enough to work in most kitchens. The size means that this option will work for up to 12-inch pizzas, which is fairly similar to other devices. One limitation is that it is not designed for thin crust pizzas, so it may not be great if that’s the style you prefer. 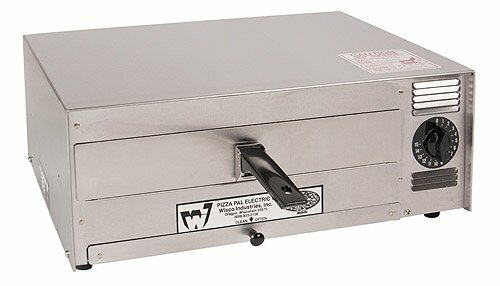 There are also other countertop pizza ovens from the same brand, although the differences between them tend to be small. The Pizzarette is marketed as ‘The World’s Funnest Pizza Oven’, which honestly just sounds weird. And, the overall style is certainly unusual as well. Still, I can’t deny that the pizza oven looks entertaining and it is something different to consider. The idea here is that you’ve got a round pizza oven with six slots. Each of these can be used to cook mini pizzas and you use small pizza peels to do so. The terracotta dome is meant to impart additional flavor and does make the product look good overall. However, the design does mean that you cannot cook regular sized pizzas, just small ones. While the concept here is slightly gimmicky, it’s easy to see how the pizza oven could be a hit. After all, the style lets people cook their own pizzas, controlling precisely how they turn out. That’s great for picky eaters or cases where you want to get everybody involved. All of these various pizza ovens can work well, although their strengths and weaknesses differ considerably. As a result, one of the first decisions to make is what exactly you’re looking for. 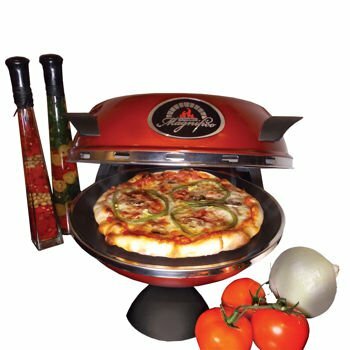 If you want something that can be used outdoors and indoors (with care), then many of the gas countertop pizza ovens would make sense. In contrast, for indoor use only, an electric pizza oven may work better. After all, these products are actually designed for indoors and would be much better if you’re limited on space. If you did that, you could always find a different solution for when you want to cook outdoors, like turning your gas grill into a pizza oven. 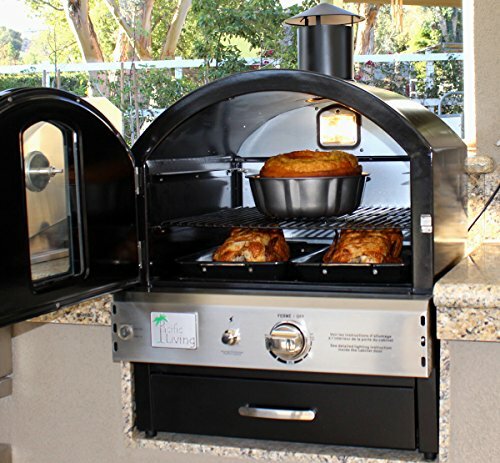 For more options, be sure to check out our post on gas pizza ovens for indoors & outdoors.